In 1943, the United States War Department released a 17-minute, anti-Nazi propaganda film warning against complicity in the face of prejudice. Some 70 years after its initial run, “Don’t Be a Sucker”—as the film was titled—has found a new audience. As Derek Hawkins reports for the Washington Post, the film's popularity has ballooned in the wake of the white nationalist rally that took place in Charlottesville, Virginia, this weekend, where one counter-protestor was killed and at least 19 others were injured. A snippet of “Don’t Be A Sucker” first went viral after Michael Oman-Reagan, a Canadian anthropologist, posted a snippet of “Don’t Be A Sucker” to Twitter on Saturday night. As of Monday morning, the clip had been retweeted more than 135,000 times from his account alone. The short film, which was updated and re-released during the Cold War in 1947, is available to watch in full on the Internet Archive. It opens with a young man who stops to listen to a blustering soapbox speaker railing against various minorities. Another member of the audience, who speaks with a slight foreign accent, turns to the young man and says, “I’ve heard this kind of talk before, but I never expected to hear it in America.” He explains that he is a Hungarian-born professor who once worked in Berlin, where he witnessed the rise of Nazism. In a flashback narrated by the professor, the film then delves into a capsule history of Nazi Germany. In a scene that patently parallels the soapbox speaker’s diatribe at the start of the film, now another crowd of men are gathered, this time in front of a Nazi speaker, who blames the country’s ills on Jews, Catholics and Freemasons. The footage cuts to a montage of Nazi atrocities: a Jewish shopkeeper is beaten, a priest is carted away by Nazi officers, an academic is arrested. The film’s rosy portrait of American diversity was undeniably hypocritical. At the time of the film’s release, schools, public facilities and the U.S. military were segregated by race. And as Robinson Meyer of the Atlantic points out, the U.S. government held 100,000 Japanese Americans in internment camps in 1943—the same year that “Don’t Be A Sucker” hit theaters. The film also did little to probe into deeper questions about “what made one become not just a sucker but an out-and-out Nazi, or about what had made Nazism take hold when and where it had,” Benjamin L. Alpers writes in Dictators, Democracy, and American Public Culture: Envisioning the Totalitarian Enemy. 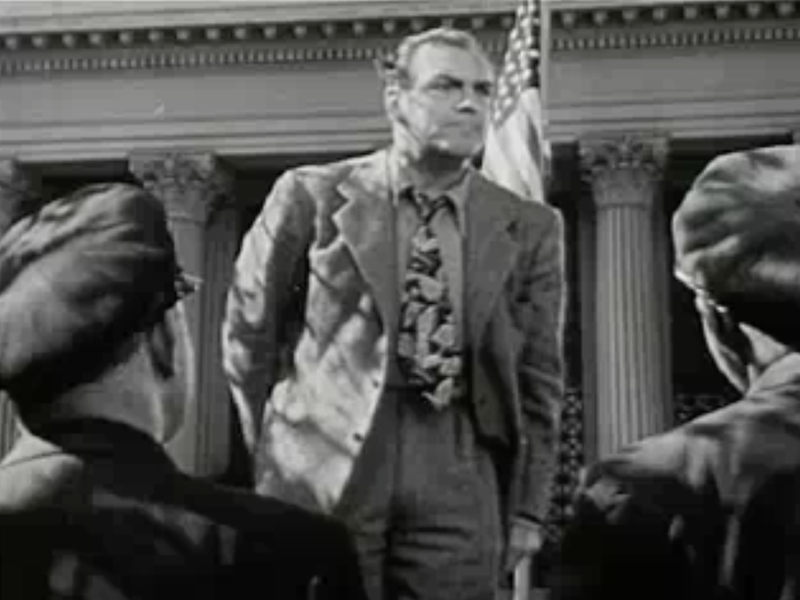 By the end of the film, the young man appears to have been swayed by the professor’s speech. He gazes at the ground, where the soapbox speaker’s crumpled pamphlets lie discarded on the floor. Then a gust of wind comes and blows the papers away.